This event was held on 2018.06.21 (Thu). 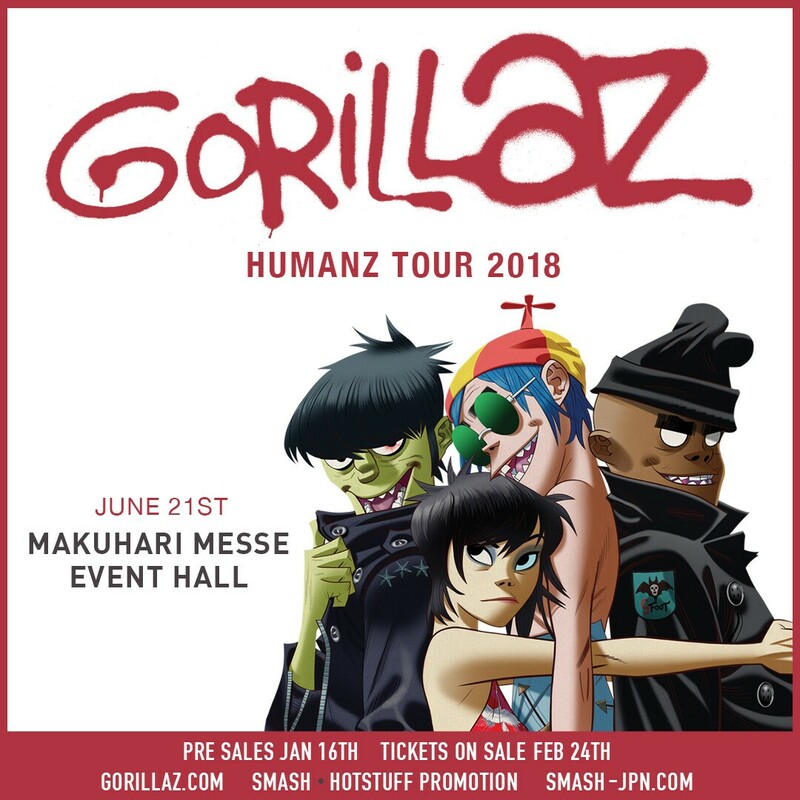 GORILLAZ 「HUMANZ TOUR 2018」in Japan at Makuhari Messe Event Hall! 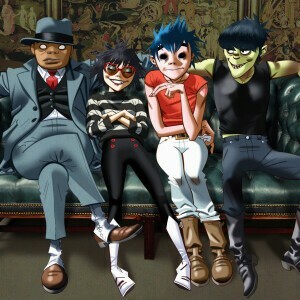 The ongoing saga of singer 2D, bassist Murdoc Niccals, guitarist Noodle and drummer Russel Hobbs continues with HUMANZ - the latest album from the planet’s Most Successful Virtual Act*, Gorillaz. Since their first release in 2001, Gorillaz have proven to be one of the most unique and iconic pop acts around. A truly global phenomenon, they have achieved success in ways entirely ground-breaking in popular music. Their eponymous debut album sold some 6 million copies following its release in 2001, with hit singles ‘Clint Eastwood’ and ’19-2000’. 2005’s Demon Days was more successful still, properly breaking the band on a global level, with singles ‘DARE (feat Shaun Ryder), ‘Dirty Harry’ and the Grammy Award-winning smash ‘Feel Good Inc.’ becoming hits across Europe, America and beyond. It gave Gorillaz their first UK No 1 song with ‘DARE’ and was heralded as one of the year’s greatest records. Plastic Beach saw the band up their game once more, with hit chart success around the world (including the US and UK) and contributions from a stellar rollcall of talent including Kano, Mark E Smith, Lou Reed, Bashy and more. Accordingly, their live performances went from strength to strength, consistently breaking new ground in both scale and ambition. And the band have since toured the globe from Birmingham to Beiruit, picking up hundreds of millions of record streams along the way. On screen, Gorillaz have proven no less innovative. Their videos, probably the most complete manifestation of the Gorillaz character identity, have been viewed continually on heavy rotation and picked up numerous awards including the coveted Jim Henson Creativity Honor. The band opened the 2006 BRITs with a 100-piece children’s choir and dueted with a holographic Madonna at the Grammy Awards the same year, while bass-wielding nasty-face Murdoc found time to record an ‘Alternative Christmas Speech’ in 2005, broadcast while HRH Queen Elizabeth was addressing the nation. By the end of 2007, Gorillaz were that rare beast - culturally significant, critically admired and commercially successful - appealing to the broadest of demographics. In 2010, Gorillaz returned with Plastic Beach. A 16-track tour through pop, rap, dub, soul, and electronica, from East to West and a whole lot more, it featured a roster of contributors so diverse it numbers not just Lou Reed, Snoop Dogg, Mark E Smith, De La Soul, Mos Def and Bobby Womack, but The Syrian National Orchestra Of Arabic Music and Hypnotic Brass Ensemble, a Chicago-based nine-piece jazz/hip-hop group. Also appearing were Mick Jones and Paul Simonon, playing together for the first time since The Clash. The subsequent ‘Escape To Plastic Beach’ tour also produced The Fall, a 15-track album of songs recorded in hotel rooms across America and gifted to fans on Christmas Day, ahead of release in April 2011. Now comes HUMANZ, Gorillaz’ first album in 7 years, and their most immediate, rich, and panoramic record to date - cycling through hip hop and R’n’B, pop and reggaeton, soul and rock and roll. 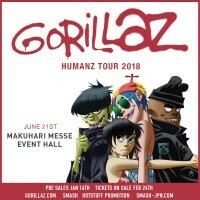 On HUMANZ Murdoc, Noodle, Russel and 2D are - as always - joined by an impressive line-up of featured artists including Jehnny Beth (Savages), Danny Brown, Benjamin Clementine, De La Soul, Peven Everett, Anthony Hamilton, Grace Jones, Zebra Katz, Kelela, Mavis Staples, Vince Staples, Popcaan, Pusha T, Jamie Principle and Kali Uchis - and sees Gorillaz pushing boundaries once again.